Order DSS’ withdrawal from NFF Secretariat, NANF tells Osinbajo – Royal Times of Nigeria. A group representing retired and active footballers today in Abuja urged the Acting President, Yemi Osinbajo, to order an immediate withdrawal of security personnel from the Nigeria Football Federation Secretariat. 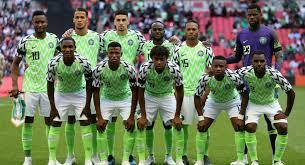 The group was led by President of the National Association of Nigerian Footballers (NANF), Harrison Jalla, as well as Victor Baribote, a former Second Vice-President of the Nigeria Football Federation. It argued that the presence of men of the Department of State Security at the Glass House at Wuse Zone 7 in Abuja is inimical to football development. During a peaceful protest at the NFF Secretariat, just before the gates leading to the Glass House, the group described the development as a violation of the rule of law. Addressing sports journalists thereafter, Jalla noted that the continued presence of the DSS in the NFF Secretariat is an affront on the Nigeria Constitution, warning that failure to do so could lead to “anarchy’’. Enyimba are doubling efforts in training ahead Sunday’s clash against Djoliba . Usain Bolt rejects Malta football offer.